Lower back pain is a very common health complaint in both men and women. Many factors can lead to strain and pressure in the lower back muscles, tissues and nerves causing pain and discomfort. The risk of developing back pain increases with age due to spinal degeneration and disc diseases. Back pain may be mild or chronic pain that can be constant or intermittent. The pain may radiate into the legs or feet causing tingling, weakness or numbness. Back pain develops when repeatedly excess strain or pressure in put on the lower back while performing certain activities or due to an injury. Through clinical examination the doctor diagnosis the symptoms of lower back pain and record the physical characteristic and history of the illness and other medical conditions to tailor a customized treatment plan. These assessments help determine the cause of pain and rule out more-serious causes of back pain. Imaging tests are recommended for acquiring a detailed image of the lower back to reveal the problems with bones, muscles, tissue, tendons, nerves, ligaments and blood vessels. At Ayur Bethaniya Ayurveda Hospital, the treatment for lower back pain or Kati shoola is planned according to the dosha predominance in the body and the underlying cause. Treatment procedures include Panchakarma therapies, herbal decoctionss, external herbal pack applications and few instructions to be adopted in the diet plan including life style modification. The treatment plans are tailored as the patient condition including the severity and nature of the disease. Ayurvedic treatment therapies may range between 3 – 4 weeks depending on individuals cases to attain maximum recovery with the treatment phase. 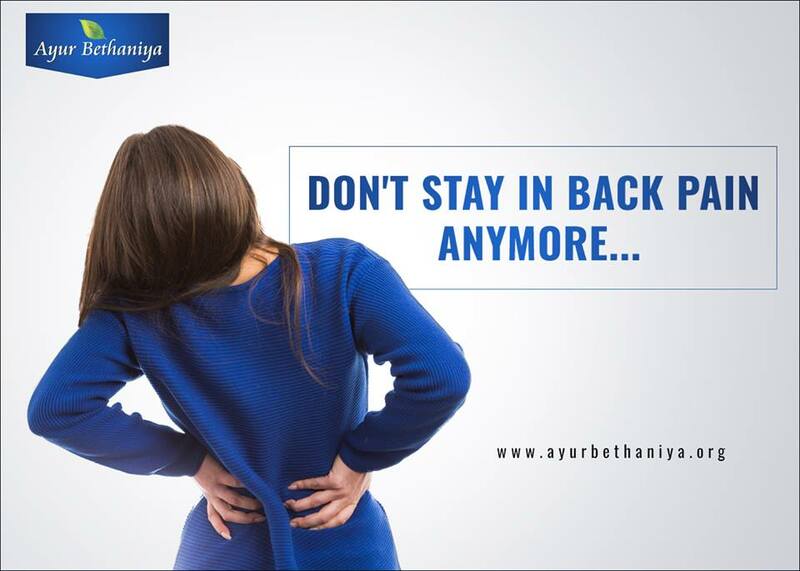 At Ayur Bethaniya Ayurveda Hospital, we provide safe and effective herbal treatment plans that are customized as per individual patient condition to treat and recover from mild to severe lower back pain. We ensure complete recovery from the condition and rejuvenate the body, mind and soul to feel a better individual. Along with the best medical infrastructure and medical utilities, we provide services from expert doctors and staffs for all round care and support to the patients. To know more about lower back pain treatment options and treatment cost, book an appointment now.